It seems we can't go more than a day without hearing about another job being taken over by a robot. While their applications for manufacturing, gaming, navigation, food service, and concierge roles are effective, some 'bots in Japan are taking things to a whole new level. Namely, passing themselves off as human author. According to Science Alert, an AI program in Japan has written a short story that progressed past the first round of a writing competition. While not clever enough to create the plot on its own, when gives phrases and a bit of framework from researchers, the robot was capable of fleshing out the story itself. The entry, entitled "The Day A Computer Writes A Novel", was submitted for the Nikkei Shinichi Hoshi Literary Award by a team of researchers from Future University Hakodate. Of the 1,450 novels accepted, 11 were written with the help of artificial intelligence. The contest openly allows non-human entrants to compete, and judges are not foretold of which works may have sprung from an electronic brain. can robots still craft masterpieces? Chief researcher Hitoshi Matsubara stated, "So far, AI programs have often been used to solve problems that have answers, such as Go and shogi...In the future, I'd like to expand AI's potential [so it resembles] human creativity." All this AND artwork? Humans, we're done for. 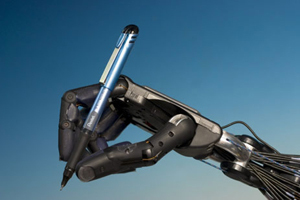 Such programs are already attempting, with some success, to create articles on finance, sports, and novelist robots. Another condensed a database of 4,000 political speeches to learn how to write them itself, using the repetitive themes and phrases as a touchstone for the new speech's tone. Not that most politicians aren't robots to begin with. This article was totally written by a human, BTW. Seriously.